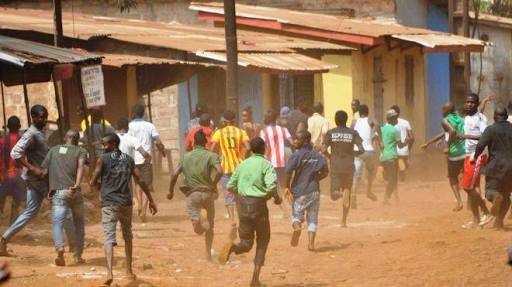 Eight persons have been wounded in a bloody boundary clash between Obbo Ayegunle in Kwara State and Eda Oniyo in Ekiti State. Youths from both communities used weapons against one another while several property were reportedly destroyed in the mayhem. Governments of both states have resolved to set up a joint committee for a lasting peace between the two neighbouring communities. Eda Oniyo is located in Ilejemeje Local Government Area of Ekiti State, while Obbo Ayegunle community is in Ekiti Local Government area of Kwara State. Ekiti State Governor Ayo Fayose, who addressed reporters yesterday after a peace meeting with leaders of the two communities at the Government House in Ado-Ekiti, warned traditional rulers to call their subjects to order. He warned that the full weight of the law would be brought upon anyone caught unleashing terror in the name of a boundary clash. To demonstrate his seriousness about lasting peace in both communities, Fayose made the two monarchs of the feuding communities to swear by the Holy Bible that they would not sponsor violence or any act that could lead to a breakdown of law and order. The governor warned that he and his Kwara State counterpart, Abdulfatah Ahmed, would not hesitate to suspend any traditional ruler whose subjects foment trouble in the two communities. He said the six-man peace panel would submit its reports in two weeks, but warned youths on both sides of the boundary to stay away from the disputed land. Fayose said: "We are not interested in bloodshed. Some people don't know the meaning of peace. Because violence pays, that is why they are doing it. There are financiers for every act of violence. "I blame this crisis on leadership failure. The two sides know the sponsors who left these people in this condition because of some worthless land. If you cannot guarantee peace in your domain, we will suspend you as Kabiyesi (monarch). This should be the last warning to both of you. "I appeal to the traditional rulers and the local government chairmen in both communities to allow peace to reign. Any young man who causes violence will go for it." Those present at the peace parley included the representative of Kwara State governor and his deputy, Chief of Staff, Mr Leke Ogungbe, the Chairman of Ekiti Local Government of Kwara State and Ilejemeje Local Government of Ekiti State as well as security chiefs from the two states.